There are some rides and shows, however, that are oft overlooked. And that's a shame. Some of them are quite good and deserve your consideration. For a place as popular as Disney World, it might be overstating it to identify any of its attractions as "hidden" gems. Let's just say that some are more under-the-radar than others. To help you plan your next visit to Mickey's Florida getaway and get some of its less heralded gems on your radar, let's run down the best of Disney World's often forgotten rides. Let's start at Disney World's most popular theme park, the Magic Kingdom. (Actually, it perennially tops attendance charts as the world's most popular theme park.) In 2012, Disney expanded the park when it opened New Fantasyland. Most visitors are familiar with the land's new rides, Journey of the Little Mermaid and the Seven Dwarfs Mine Train, as well as its ultra-famous Dumbo the Flying Elephant. But Enchanted Tales with Belle often gets lost in the shuffle. It's a charming walk-through attraction that ends with a brief interactive show. Some of its animatronic characters, particularly a remarkably fluid Lumiere the candelabra, are striking. The target audience for Enchanted Tales with Belle is young children. Unless they are Beauty and the Beast fans or Disney diehards, tweens, teens, and adults without children would probably want to skip it. But it is one of Disney World's best attractions for kids, and kids and their entourages should not miss it. When guests go to the Magic Kingdom's Tomorrowland, they generally make a beeline for Buzz Lightyear's Space Ranger Spin and (especially if they are thrill ride fans) Space Mountain. But there are two other attractions in the futuristic land that are worthy of your attention. One is Monsters, Inc. Laugh Floor, which features Mike Wazowski and his buddies from Pixar's Monsters University and Monsters, Inc. Using real-time, on-the-fly animation, an impressive innovation from Walt Disney Imagineering, the onscreen characters are able to interact with live audiences. The comedy can be hit or miss, but you're bound to have a few chuckles—and you'll be wowed by the technology. The very first attraction to feature audio-animatronics was the Tiki Room at Disneyland. The Disney World version of the show, which is located in the Magic Kingdom's Adventureland, is based on the 1963 original. The show, with its singing birds and flowers, holds up well today. Adults appreciate its historical significance and bask in its nostalgia, while kids delight to its timeless charm. When it firs opened, Epcot had more of an "edutainment" focus. That's been changing as it evolves and introduces more family friendly characters and attractions. But many visitors still think of the park as being primarily for adults. Hdden inside the former Living Seas pavilion, however, are two of Disney World's best attractions for kids. They are also two of the resort's most overlooked attractions. One is The Seas with Nemo & Friends ride. 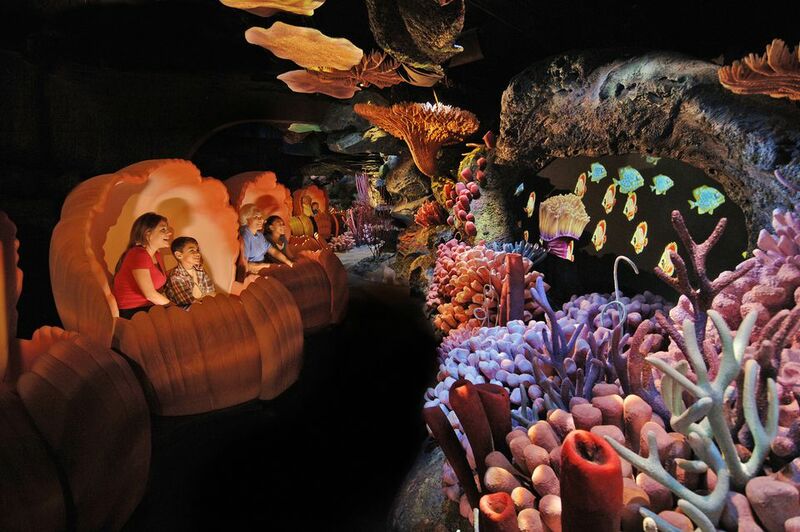 Guests board "clamobiles" and watch an adventure unfold featuring Finding Nemo characters. The genius of the attraction is that the animated scenes are seamlessly projected onto the pavilion's saltwater tank, and Nemo and his buddies appear to frolic amid the actual fish in the aquarium. Nemo's pal, Crush, stars in his own show in a theater next to The Seas ride. It was the first attraction to feature Disney's groundbreaking real-time animation. Compared to the similar Monsters, Inc. Laugh Floor, Turtle Talk is more intimate, more charming, and, generally, funnier. (Because it is interactive and largely improvised, performances can vary.) The technology is so invisible that young kids completely buy into it and nonchalantly, if delightedly, chat with the righteous turtle dude. Parents, meanwhile, stare in disbelief and wonder how an animated sea creature is able to converse with their children. Don't just walk past Epcot's Mexico pavilion thinking that there's probably little more than a restaurant and a gift shop inside. They are, but there is also a cute boat-based ride. Part Mexican travelogue and part Fantasyland-like dark ride, Gran Fiesta Tour Starring The Three Caballeros combines animatronics, projected media, practical sets, and other theme park trickery. It features Donald Duck and his two south-of-the-border amigos, Panchito and José Carioca. It's not as sweet or as engaging as "it's a small world," but it's fun nonetheless. Not to be confused with the Journey of the Little Mermaid ride at the Magic Kingdom, this show at Disney's Hollywood Studios uses puppets, media, live performers, and special effects to tell the tale of the underwater princess. The beloved movie's songs, including “Under the Sea” and “Part of Your World” are featured in the presentation.